Windbridge Institute researcher Mark Boccuzzi discusses building and using a Symbolic Hieronymus Machine to predict the future. In June 2018, Boccuzzi presented “When Pundits Fail, Psi Prevails: Using a Symbolic Hieronymus Machine to Accurately Predict Voting Outcomes in Battleground States During the 2018 U.S. Presidential Election” at a joint meeting of the Society for Scientific Exploration and the International Association of Remote Viewing (SSE/IRVA). Boccuzzi’s article below is based on his SSE/IRVA presentation. The project discussed was exploratory in nature and this article should not be considered a formal research report. The results presented should not be mistaken for any kind of claim. The article is provided “as is” without any warranties. On November 8th, 2016, The United States held its 58th presidential election. Prior to the election, there was much debate, discussion, and speculation about the outcome. On November 4th, the news network CNN updated the election map on its website to indicate that they had identified six “Battleground” or “Toss-up” states: Arizona, Florida, Nebraska’s 2nd Congressional District, New Hampshire, Nevada, and North Carolina. By definition, a Battleground state or race is one where the race is too close to call using traditional data collection and analysis techniques. 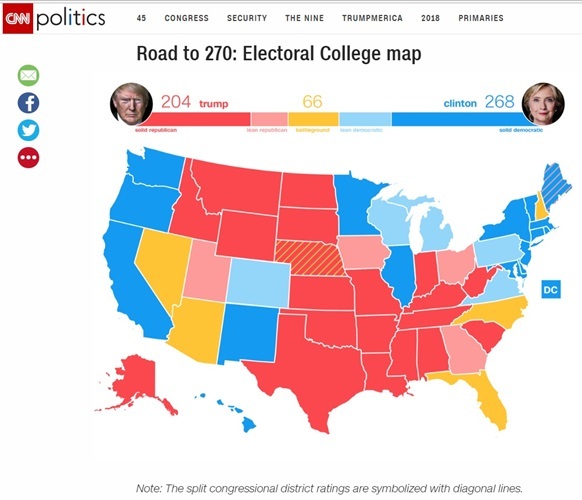 As I looked at the map I wondered if there was a way to use psi to predict the colors these states would become on the map at the end of the election. Using this map was interesting to me because it is a small data set (which is nice for something exploratory), the outcomes are binary (Red or Blue – which makes interpreting results easy), and the real-world outcome would be available in just a few days. Typically to make a set of predictions like this, I might use a technique called associative remote viewing (ARV). I have used ARV in the past to predict the outcome of sporting events with some success, but this time I thought I would go a different way. I have been fascinated by the idea of symbolic machines since I first read about them in G. Harry Stine’s book Amazing and Wonderful Mind Machines You Can Build back in the mid-1990s. Symbolic machines are representations of actual electronic or mechanical devices. Probably the best-known is the Symbolic Hieronymus Machine (SHM). 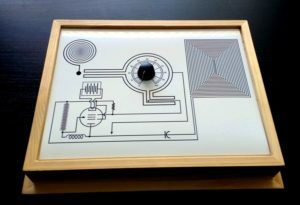 In 1949, electrical engineer Thomas Galen Hieronymus was awarded a U.S. Patent for his device which could be used for the “detection of emanations from materials and measurement of the volumes thereof.” Hieronymus coined the term “eloptic energy” to describe what the device was measuring. However, if one looks at the plans for the device, it follows no known physical laws. It simply shouldn’t work. However, people claim that it does. My interest in the SHM had recently been renewed after running into this blog, so I decided I would try to make one of my own using the provided designs. The SHM used in this project. Construction details are provided at the end of this article. –A sample of the material to be measured or a representation of the sample (also called a “witness”) is placed on the tray area (circular shape in the upper left of the device). 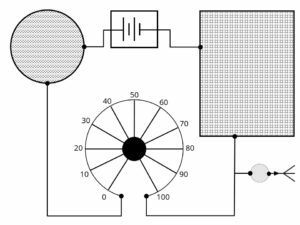 –The operator then slowly rotates the rate dial (knob near the center of the device) while simultaneously stroking the touch plate (rectangular shape on the right of the device) with a finger. 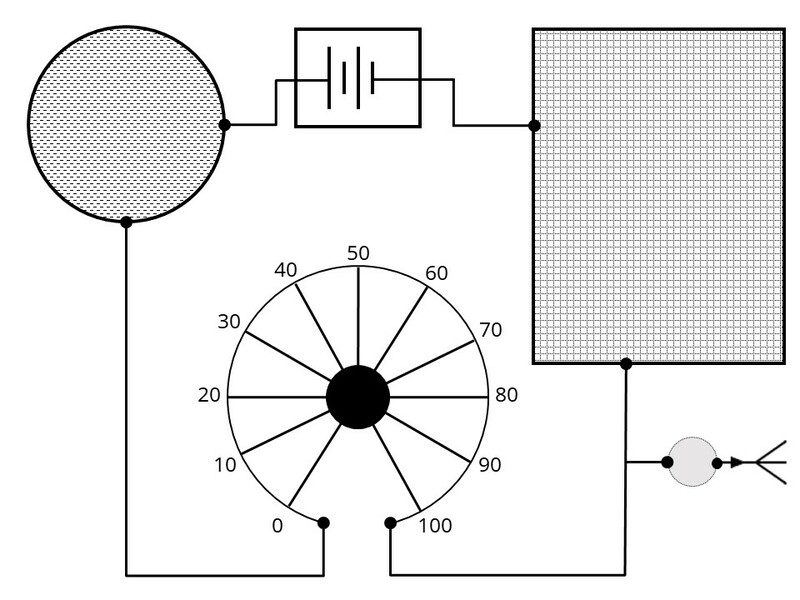 –The value reflected by the dial at the time of the stick is the rate of the sample or witness on the tray. So, how do you use a device that generates rates for a given sample to predict a future event? 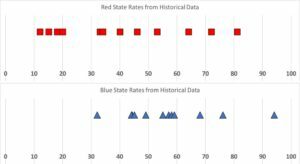 My solution was to first establish a set of benchmark rates of traditionally Red and Blue states and then compare those benchmark rates to a witness which represents the future color of each of the six battleground states. I know that may sound a bit complicated, but I’ll walk you through it. Using information from this site, I identified eight states, four “Red” (Alabama, Alaska, South Carolina, Texas) and four “Blue” (California, Michigan, New York, Washington), that voted for the same party in the last four presidential elections. I then made a set of cards with each state name and their associated color printed on the back (for example, “Texas, RED”). I then made two more copies of the completed set so I could measure each state three times, giving me a total of 24 cards. 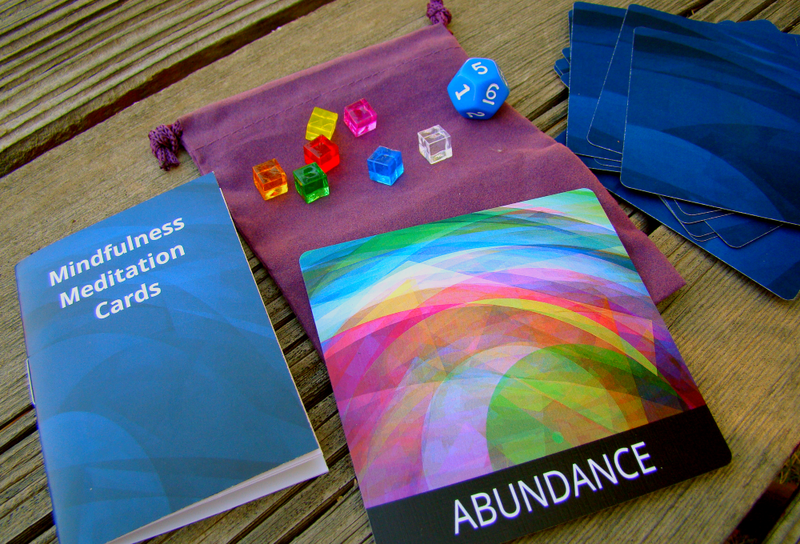 The cards were then folded, sealed, and shuffled to create a random order. Each card served as a witness for the state it represented and was placed, one-at-a-time, on the tray of the SHM. 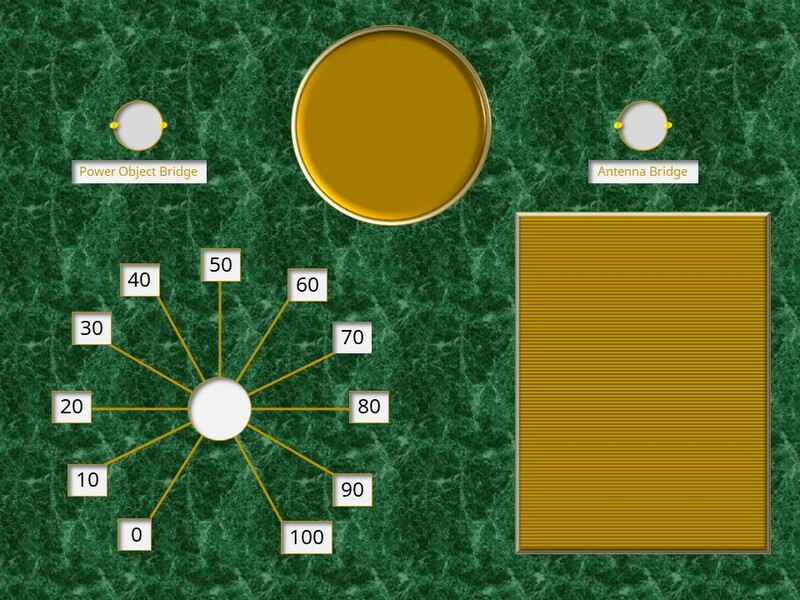 The knob and touch plate were then used to take a measurement for each card. The resulting rate was then written down on the back of the card and the card was put aside. This process was repeated for all 24 cards in the set. This procedure kept me (loosely) blinded as to which state I was measuring. I can say that at the time I had no conscious idea of which sample I was working with. Once all the cards were rated, they were opened and sorted by state color and the mean was calculated for each group (Red and Blue). 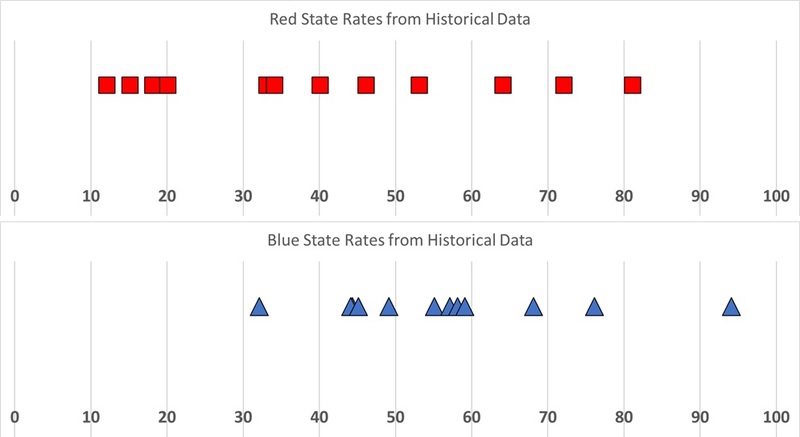 The average for all the Blue states is 56.75 while the average for all the Red states is 40.67. With mean values for Red and Blue states calculated, I created a new set of cards for the six battleground states. 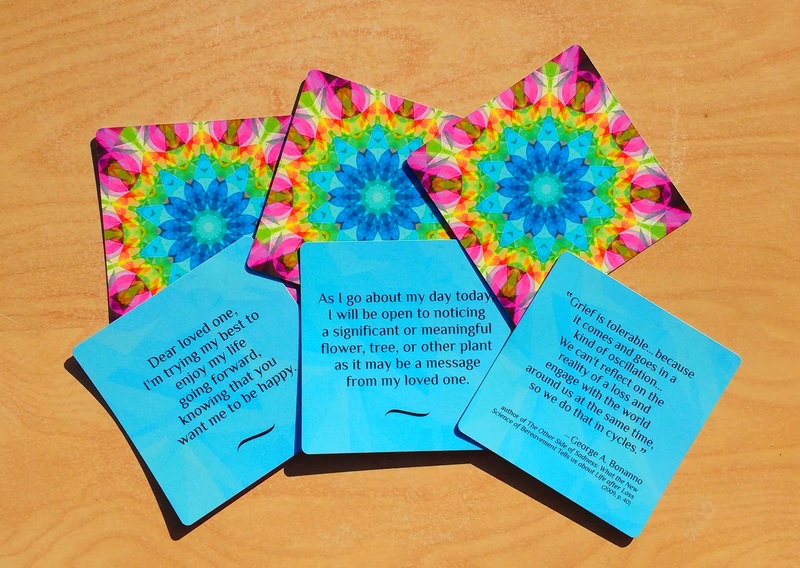 These six new cards only had the name of the state on them and did not include a color. After recording all the rates, I graphed the results against the benchmark rates (see below). The graph above shows each state prediction along with the final electoral college map. Nevada and New Hampshire were correctly predicted as Blue states. Florida, Nebraska, and Arizona were correctly predicted as Red states. North Carolina was incorrectly predicted as Blue. The SHM method made five correct and one incorrect predictions. That’s not bad when you consider that the pollsters were unable to provide any kind of meaningful prediction using conventual methods in the same timeframe. As a follow-up, I repeated the prediction procedure but replaced the SHM with a truly random source which provided me with a randomly generated “rate” between 0 and 100. Using this method, only two states were properly predicted. My research in applied psi continues to support my assertion that these types of experiments work best when the test has no reasonable non-psi method to determine the outcome. There seems to be a relationship between “need” and positive outcomes. However, this idea is still being tested. The original Hieronymus Machine falls under the umbrella of radionics, psionics, psychotronics, etc. These topics have a vast amount of literature, lore, and tradition surrounding them and I do not profess to be an expert in any of these areas. However, from what I can find, using an SHM for outcome prediction might be a novel application. 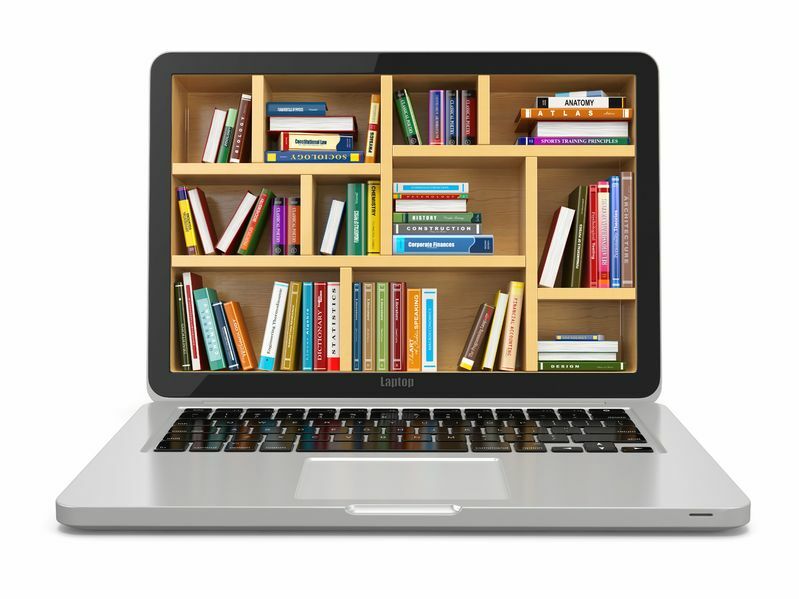 When I was researching the SHM, I found that it comes with a lot of preconceptions and expectations about the “right” and “wrong” ways to use it. If these pre-established expectations are embraced by the operator, they may limit successful outcomes in new applications. My research suggests that not everyone who tries to complete a psi task is successful at every type of task. For example, while someone may be a highly accurate controlled remote viewer, they may perform poorly when using psychometry. It is my current working hypothesis that a one-size-fits-all approach to psi isn’t useful. In order to optimize success, people need to select a psi modality that resonates with them. The SHM may add a new prediction tool to the mix. Because most existing psi devices/methods come with their own form of expectation bias, it may be necessary to create new classes of devices and processes which can appeal to different, specialized audiences. One machine may not work for everyone. While this was a fun and interesting test, there are a number of things that have to happen before it should be considered a proper experiment. These would include stricter blinding, a lot more trials, and the proper application of statistical tests. Then there would need to be external replication. With upcoming elections taking place here in the US later this year, I may have an opportunity to do more testing. I’m also interested in better understanding the “stick” phenomenon. As others have pointed out, it is most likely related to galvanic skin response (GSR), but I think it would be interesting to specifically test that. A better understanding may provide a more precise way to measure the effect and possibly increase the prediction accuracy. Finally, I have started to design my own symbolic machines. These have been designed to meet my personal research goals and I’m looking forward to testing them out. When it comes to personal experimentation with psi, I believe that people should make their own psi devices whenever they can. This allows the creator to set the intention for the device at its inception and during its creation. Also, the process of creation allows one to form a personal connection with the device. If you ever wanted to try to build your own psi device, you can’t find one simpler than the SHM! For the tests I described above, I used the design from the josephmax blog. It has all the images and instructions you need to build a basic version of the SHM. It also has some simple operating instructions. 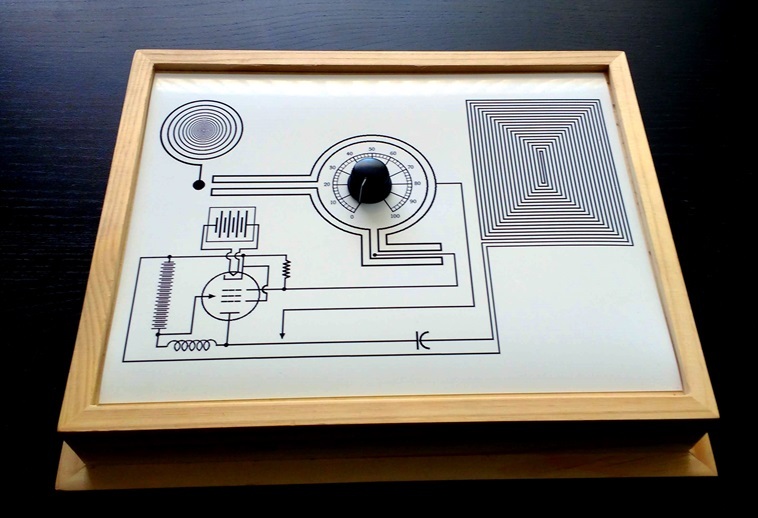 For my version, however, I did modify it slightly: I removed the labels from the graphic (as I found them distracting); I replaced the paper dial pointer with a plastic knob (which I pulled off of some spare parts in the lab); and the final design and knob were mounted on a wooden base. While I like this design, I wanted to add a couple of features and needed it to work with other physical parts that were readily available. I’m also interested in seeing just how far I can push the design. Does the machine really need the electronic components represented or can the entire structure of the device be virtual? Feel free to use these in your own experiments (note that these images cannot be included in commercial products/services). If you don’t like these designs I would encourage you to create one of your own! Once you pick your design, print it out in landscape format. I find that 8.5”x11” glossy photo paper works best. It looks nice and provides a nice surface for the stick plate. For the base, I found that this wooden shadow box works well. The printed photo paper fits perfectly on the BACK of the box. This gives a nice raised platform to work on (see the photo of the SHM above). You can use a little bit of craft glue to secure the paper to the box. For the rate dial, I am using one of these knobs. With the paper secured to the back of the shadow box, I used a small electric drill (be sure to follow all safety precautions! Kids: get help from an adult before using any tools!) to make a hole through the paper and into the box at the center of the dial image. Then, from the inside of the box, I pushed the knob shaft through the hole and put the knob cap on. Remember, not all devices are going to work for everyone. The issue that I hear most often is that people can’t feel the stick. If this happens to you, that’s O.K. There are other psi modalities that might work better for you. In the future, I’ll be posting about a simplified prediction protocol and tests involving broadcasted intentions. Be sure to join our email list for updates on these projects and other Institute news. Next PostTest Your Positive Precog Ability Online!